Gonna be a while 'till actual creation begins. Have to finish remodeling before I can set up shop again. what is the configuration of your ultrasonic sensors to pins? I am looking at your block-prop code and I'm just wondering which sensor is connected to the pins 14, 15, 16, 17. Are the drawing files you used to cut this out available someplace? I would like to try making a set of the two decks (top and base) with my glowforge laser cutter. @Roy Eltham - have them at home on my computer - will send them tomorrow! I'm working on a variant that will work with my laser cutter (max 11x19ish cut area). I'm, also, attempting to make a new power distribution switch/cover plate that says mArlo cut out like the normal Arlo one, had to trace an image of it since the cut file isn't available. Great, Roy! My m-Marlo was a tad under 12" in diameter due to the size of the cutting boards I used. Can't wait to see how your m-Arlo switch/cover plate comes out! I used a scrap piece of shiny black 1/8" acrylic for this. Here's an update on my version of mArlo! This is cut out of 1/4in mdf, just to test fit and get an idea of size. I'll be using some other material(s) for the final version. Note, I added another "level" because I wanted to use my casters without modification. You substituted some longer posts in there? Did you make those yourself? My new level still needs some work and cleanup, it's just a rough shape right now to get things together. Once I get everything dialed in, I'll share the SVGs so you or others can see how it goes together or make one. What a beauty, Roy! Keep me posted! Here's my nearly final version, still in MDF. I put my decks closer together because the battery I am using (a 50000mAh Lithium based) isn't as bulky as the SLAs. You can see it placed in there for size. I really like how this is turning out, thanks Whit for sharing your idea and files for me to use to build on. Roy! It really looks great. Can't wait to see it run. Perhaps this weekend if I can get the wiring sorted. On the two bases I built recently, I used some mini dual-wheel casters (front & rear) with plastic wheels and they interfered mightily with steering. They would always kick the bot off to one side after a major maneuver, even with hardly any load on them. Maddening. I ended up replacing them both with fixed plastic wheels that didn't caster, much like Boebot's ball wheel. Worked much better, even though they skid in a spin. Pic & video attached. Those casters I am using are the ones used on the real Arlo (and earlier variants like Eddie, and Ken's wood version). They seem to work pretty well, partly because of nice bearings, but also because the whole wheel assembly is behind the pivot point. Also each wheel spin independently. So, when you do a turn they just pivot easily instead of causing a kick off to one side. I've had a hard time finding a small variant of them. I'm thinking about trying to fabricate my own. Here's a closeup of the little plastic casters I tried and the white wheel (removed a Home Depot caster) I ultimately used. Very important to have rounded edges on a wheel when you drag it sideways on carpet. The ones are on the Arlo are super nice ones fabricated by Parallax on their milling machine, and use nice sealed bearings on the pivot. 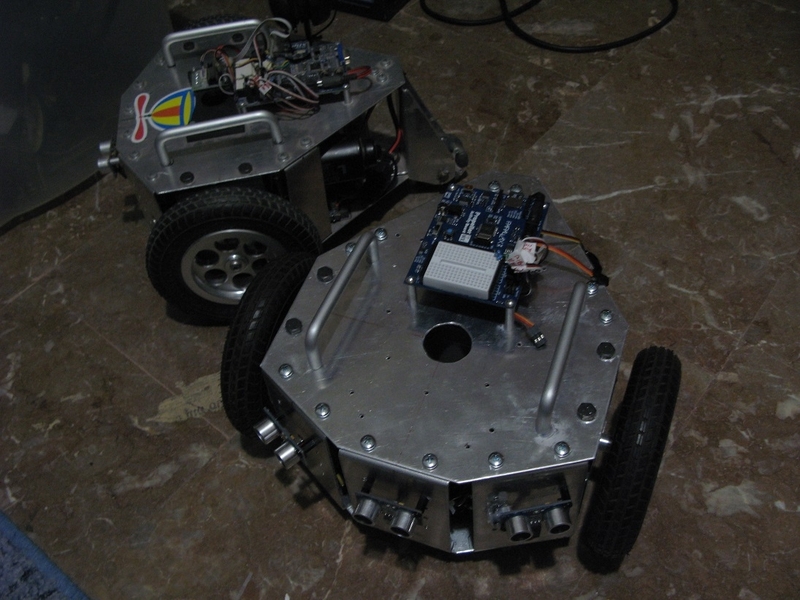 Who will be the first to make a destructive Battlebot and let others drive it on letsrobot.tv? 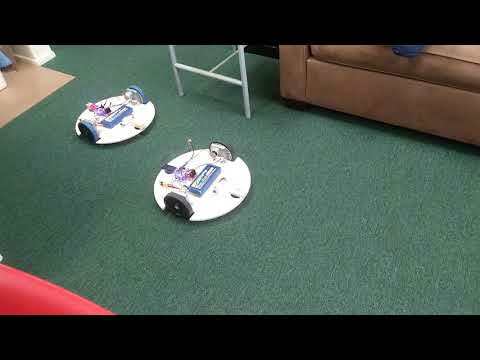 Jill from letsrobot is working with another group that does battlebots to make just that. They have done some tests with it destructing paper cups and cardboard boxes. The goal is to fight it against an AI battlebot, and possible another letrobot controlled battlebot. Awesome work here from you and from Roy!!! Congratulations!!!! I'm thinking to turn my second wheel kit to a "mArlo"! I think "mArlo" is the ideal design for a representation robot using the LetsrobotTV site. @NikosG - Can't wait to your version of mArlo! I finally followed again the Artist's design, because I had already some pieces from that chassis and this time I put on it the Propeller Activity Board WX, the same board that uses the original Arlo. Trying to program it with the Blockly Prop I found difficulties because the original Arlo uses the DHB-10 motor controller instead of the HB-25 motors controllers that I use. 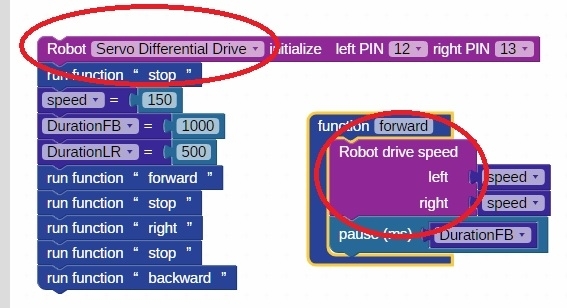 However, that synthesis could work fine with Blockly Prop using the Activity Bot calibration command. Now I'm trying to find ways to program it more efficiency with Blockly prop! Looks great Nikos! I always love the Artist design. Merry Christmas Nikos! Love that robot! I haven't seen any Artist chalk drawings recently. More specifically, indoor chalk drawings on the carpeting. Just curious if your wife put her foot down (in dusty chalk) and stopped your experiments!!!??? Anyway... the reason I stopped the drawing with Artist is that I want to make the drawings with BlocklyProp. The only way to do that right is to follow the "Arlo" configuration.